Right now, Vijay is for sure one of the most bankable superstars in K-Town. His screen presence, dialogue delivery, dance moves and stunts uplift a movie's overall output. For Vijay, music in particular has always been a backbone for his films. Songs, apart from the motion posters and teasers, create the first major attraction and result in an affinity or bonding for the general audience towards a movie. Vijay has been blessed with some wonderful chartbuster numbers all through his career. Hopefully his upcoming movie, Puli should continue his successful musical winning streak. 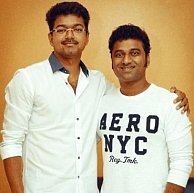 Vijay joins hands with Devi Sri Prasad for Puli and the audio rights have been bagged by Sony Music for a huge price. It must be noted that Vijay’s Thalaivaa music was also released by Sony Music, while Kaththi was released by Eros Music, Jilla by Star Music and Thuppakki, Nanban by Gemini Music. It Took 3 Hours For Vijay To Do It For His Team! Ilayathalapathy Vijay Fulfills His Fans' Wishes..
People looking for online information on DSP, Ilayathalapathy, Puli, Sony Music, Vijay, Vijay 58 will find this news story useful.